More than anything, ENFPs want the opportunity to use their enthusiasm and originality to innovate and create. They are less concerned with stability and job security and more concerned with variety, independence, and positive teamwork. ENFPs are eager to think-outside-the-box and consider new possibilities that veer outside of traditional norms. They are good at taking risks, learning quickly, and seeing the big picture and future implications. Most of all, ENTPs want a job that allows them to be original and creative. They don’t mind taking risks or forgoing job security so that they can gain a higher pay, travel, or work independently. These types like pushing the boundaries in technology, science, and the arts. They like to think beyond the bounds of what exists and venture into new, unforeseen territory. They are risk-takers, visionaries, and enthusiastic team leaders. They are good at troubleshooting, thinking outside-the-box, and seeing the big picture and future implications. Lets them envision and begin projects but involves others in the completion. INFPs crave a job that is in harmony with their personal values and beliefs. They have little interest in a job with security but no meaning or humanitarian impact. They like a lot of autonomy in their work and they want opportunities to be creative. Naturally guided by their inspiration, INFPs tend to excel in artistic fields, writing, or counseling. They desire a job where there is a nurturing, friendly atmosphere and everyone’s unique gifts are fostered and praised. They are skilled at perceiving people’s needs and motivations, shifting gears, and seeing the big picture and creative possibilities. INTPs crave a job that allows them to create original solutions to varied and novel problems. They are innovators and logical thinkers who feel trapped by a routine, by-the-book kind of career. They don’t mind forgoing some job security if it means they have a bigger chance of getting higher pay or working in an advanced, innovative position. They like jobs that allow them to travel, work independently and with a variety of tasks. They are skilled at thinking outside-the-box, finding original solutions, and analyzing and critiquing new ideas. ENFJs crave a career that gets them involved with diverse people and allows them to find original solutions to humanitarian needs. They are good at creating a warm and supportive environment and thinking outside-the-box to improve the lives of people. They enjoy working as part of a team and being busy and productive. They are stimulated by goal achievement and they feel at ease in an environment with a clear structure and clear expectations. They are most motivated when their job will have a long-term positive impact for people. ENTJs crave a job that allows them to be independent and achieve big goals. They are highly productive, task-oriented individuals who like to stretch the bounds of tradition to create innovative systems and companies. They don’t care so much about job security or ease of work, in fact, easy is boring to them. They like a challenge and they get a thrill from having a variety of complex tasks to accomplish. They are skilled at seeing the big picture, strategizing, and implementing systems to make organizations more effective and efficient. Has a well-organized, structured environment. 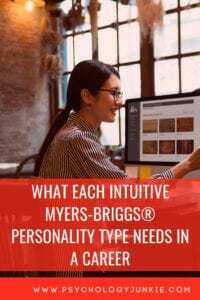 INFJs thrive in careers that make use of their creative abilities and engage them in a variety of tasks that have humanitarian purposes. They crave autonomy and are skilled at independently setting and achieving goals that have long-range impacts for their organization. They are good at seeing the big picture, foreseeing future implications, and working with people. They tend to need a lot of time to formulate and envision their plans, but once they have a clear idea or strategy they can move very quickly. INTJs need a career that allows them to be creative, independent, and original. They don’t want anything run-of-the mill and they’d happily forego job security if it means that they can achieve higher goals or work at something that is intellectually challenging. They enjoy being innovative and improving existing systems by logically organizing them to be more effective. They like to work in an organization that has a clear structure with room for autonomy and creativity. They also demand fairness in the workplace; preferential treatment and emotional manipulation are to be strictly avoided. Have you enjoyed this article? Do you have any suggestions to add? Let us know in the comments! You can also follow me on Facebook, Instagram, or Twitter!